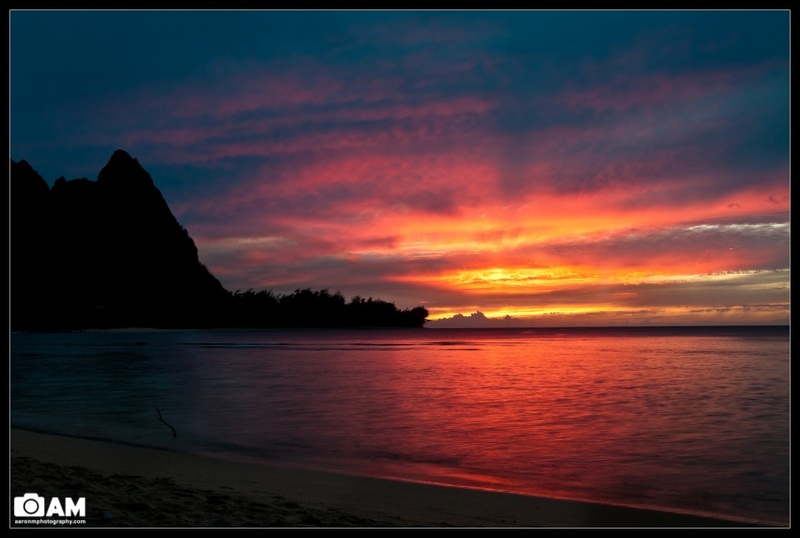 This is one of the most gorgeous sunsets that I’ve seen, while sitting along Tunnels Beach on the north shore of Kauai. My friend and I rented scuba diving gear so that we could do a shore dive off this beach (it was supposed to have one of the best shore dives on the island). We spent an hour snorkling around trying to find the ”60ft drop-off” but never found it! Eventually we gave up, dropped down to the 15 ft bottom and just practiced scuba diving. I got out of the water just in time to run to the car, grab my camera/tripod and catch this sunset. Note: I edited this on my new Dell U2410 monitor, which is calibrated and set to sRGB mode. The colors in the sky are more of pinks and light oranges/reds. On my old 20” Dell, the colors are very saturated and more red looking. How do you all see this photo? Does it appear over-saturated? It looks perfect on my new monitor, but I kinda dislike it on the old monitor. Any thoughts?